Learn how to migrate your business to the cloud efficiently using this practical guideKey FeaturesGain an understanding of the core design elements to build scalable and highly available systems in the cloudPlan resources and technology stacks effectively to ensure the highest security, availability, and fault toleranceA hands-on guide that covers core architectural principles using real-world examples and use casesBook DescriptionCloud computing has proven to be the most revolutionary IT development since virtualization, with more disruptive effects. As the services offered by cloud vendors expand and mature, enterprises of all sizes are finding that their old development models and architectures do not port to cloud. In order to truly harness the value proposition that the public cloud has to offer, businesses need to refresh. 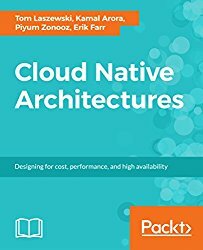 In this book, we seek to demonstrate three essential components of deploying truly modern, cloud native architectures: organizational transformation, deployment modernization, and cloud native architecture patterns.The book starts with a quick introduction to Cloud Native architectures that is used as a base to define and explain what cloud native architecture is and is not. You will learn what a cloud adoption framework looks like and develop cloud native architectures using microservices and serverless computing as design principles. The book dives deep into major pillars of cloud native design that includes scalability, cost optimization, security, and ways to achieve operational excellence. You will learn about various public cloud architectures ranging from AWS, Azure to Google Cloud Platform.Finishing off with a discussion on future trends and expectations from cloud providers, this book will equip you to adopt cloud native architectures that meet your business requirements.What you will learnRecognize a cloud native architecture versus traditional architectureExplore the aspects of migration, when to use this approach, and why you would want toIdentify the elements to consider when selecting a technology for your architectureAutomating security controls and configuration managementUse infrastructure as code and CICD pipelines to run environments in a sustainable mannerUnderstand the management and monitoring capabilities for AWS Cloud native application architecturesWho This Book Is ForSoftware architects who want to design resilient, scalable and highly available applications that are native to the cloud, will find this book interesting. Joomla! 1.5 & VirtueMart: The Power is at your Fingertips!